Which Simulator Should You Buy (April 2019)? Whenever I talk to people about my hobby, sooner or later during the conversation I always receive the same question: which simulator should I buy (and will my computer be able to run it)? This is not an easy question, as it vastly depends on which kind of person you are talking to. He or she may be a gamer, an aviation enthusiast or an experienced pilot...and may prefer a long peaceful flight in an airliner, a scenic bush-flight over a wild region or an historically accurate air battle. Therefore I typically reply with another question: what would you like to do in the simulator? Depending on the question I will try and direct them to the simulator that may be the best fit between the ones I know (relatively) well. So, as a quick recap and a go-to reference for the people I speak with, here is what I think of the simulators I use the most, and what I believe to be their strong and weak points as of today April 20th 2019. In general you need a fast computer (I'd say a 3.0 GHz quad core minimum) and a good graphic card (by today standards a GTX 960 is probably the bare minimum). Some simulators run better than others, but running a modern flight simulator without a good computer is an exercise in frustration. A Windows PC is preferred over an Apple computer since not all the simulators are available on the latter. Along with a fast computer with a good graphic card, you'll need memory (some sims can run with 4Gb but 8Gb should be the standard) and a sizeable available space in your hard drive. The required space will depend on the add-ons you will use, but I'd say that 256 Gbyte is the bare minimum...but be warned that many simmers typically have dedicated hard disks with 1 Terabyte or more: some add-ons (and in particular high detail photoreal sceneries) take a lot of space. One last thing before we start: you'll need a flight stick. You do not necessarily need a replica of a real one, and you can buy a decent one for 40-50 Euros or less. But trying to use a flight simulator without one will drive you crazy. Be sure that it features a throttle control and a "twist" motion for the rudder. 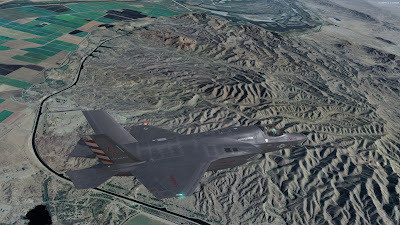 Several years ago, Lockheed Martin acquired the rights to the Microsoft ESP platform, which was basically a tentative to market Flight Simulator X for professional simulation / visualization purposes. 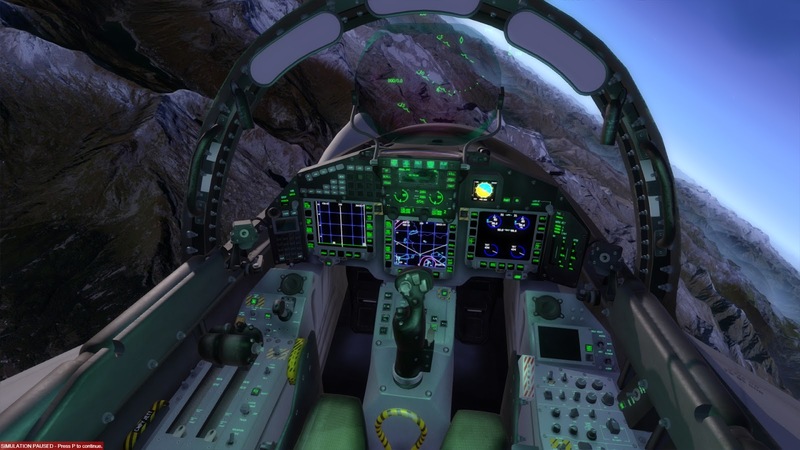 Lockheed Martin has constantly upgraded this simulator, adding a new rendering engine and a 64 bit code and maintaning a good backward compatibility with FSX. With the failure of Microsoft Flight and Dovetail Flight Simulator World, Prepar3D is the "de facto" heir to the venerable Flight Simulator legacy. Disregard the incredibly expensive "Professional Plus" version which is meant for military use. - Backward compatibility with many FSX add-ons means that there are literally thousands of good quality add-ons, either free and payware. It is highly likely that a good rendition of your favourite plane or airport alreadyt exist for this simulator. - Very flexible experience: you can fly anything from a glider up to a 747 anywhere around the world. - Default content is not great and the base scenery is outdated (looks a lot like Flight Simulator X). You'll need some add-ons to make it look good. - Needs a very powerful computer to run well. Basically anyone who has an interest in flight simulation...but be warned: the default content is not great and you'll need to get some add-ons: there are some great freeware ones, but the best ones are typically payware. Users who have no will to look for (and eventually buy) add-ons to improve the simulator. Users interested in air warfare simulation: while P3D has a wide choice of (excellent) military aicraft, it does not support weapon functionalities by default (unless you buy the professional plus edition - which I do not recommend) although it can do that with packages such as vACMI, Tacpack or others. If you are interested in air combat you should first check DCS. - Simulation engines is based on an actual fluid dynamics model: arguably a superior approach with respect to table-driven engines like the one of FSX/P3D. - Graphic engine runs well and does an excellent job in portraying small scale details. - Some of the default aicrafts are really well done. - Fantastic night lighting effects. - Default terrain textures are quite bland and repetitive. You'll need add-ons to make it look good. - During the day, the default lighting engine is not great (poor water rendition, bland daylight brightness and shadows, poor cloud rendition). - While there are some excellent add-ons out there, P3D in my opinion still has the lead with a wider selection of better quality add-ons (but the tide is changing). Basically anyone who has an interest in flight simulation. It is a great simulation and does a lot of things better than P3D (but not everything). If you have an Apple or Linux system, this is the best flight simulator you can buy. If you have a PC, choosing this over P3D may depend on your computer and which add-ons you would like to use. Aerofly FS 2 started as an attempt to bring a decent flight simulation experience to high end mobile devices and then was scaled up to a fully-fledged desktop experience. While its heritage still shows in the user interface, the fact that the simulator was designed for the limited resources of a mobile device makes it so that it runs really well on desktop computers, providing exceptionally good frame rates even if your hardware is not the latest and greatest. However there is no traffic, no multiplayer, no ATC and basically no weather system. It is just you, your plane and the photoreal scenery. - Exceptionally efficient graphic engine: runs really well and provides a fantastic performance in Virtual Reality. - Very sharp photoreal textures (default scenery covers the majority of the western United States). - Excellent choice of good quality default aircrafts. Both external and internal models are done really well. - No ATC, no traffic, no multiplayer: it is just your aicraft and the scenery. - No water shaders, no cloud shadows, very basic clouds and almost non-existent weather system. - Scenery coverage is limited to some areas of the world (coverage is slowly being expanded through add-ons). Anyone who would like to fly over a super-sharp phoreal rendition of the State of California or over the Grand Canyon. Flying in Virtual Reality is very impressive in terms of immersion and "feeling" due to the exceptionally high frame rate. Anyone looking into something more than basic flying: absence of traffic, ATC or multiplayer is a big drawback. And needless to say there are no military functionalities. Starting from the heritage of a successful combat flight simulator like Lock-On Modern Air Combat, Digital Combat Simulator (DCS) has become arguably the best air combat simulator available on an home computer. You can download the base software for free but it only features one map (Caucasus) and two planes (SU-25 Frogfoot and the TF-51 Mustang) - then you can buy a number of sceneries such as the Persian Gulf or the Nevada training range, and a growing selection of excellent aircrafts (including the F-14 Tomcat, the F/A-18 Hornet, the A-10 Thunderbolt and the AV-8B Harrier II). These add-ons are not cheap...but they are extremely realistic and detailed. WWII and Korean War warbirds are available too. DCS also includes a detailed simulation of ground vehicles and ships. - The general quality of the add-ons is outstanding: while some of the planes are a little expensive, they are typically the best rendition available of the machine they depict. - Scenery is divided in "maps" you need to buy. While they are large, you cannot fly anywhere in the world. Anyone interested in digital military simulations. DCS is the best combat simulator on the market. Anyone not interested in air combat. You may also want to check in advance if your favourite plane is or will be available for the platform, since the current selection of vehicles is somewhat limited. Flight Simulator X is still available on STEAM for 24,99 euros, although I think it is outdated and I do not recommend buying it. You may still consider it as an option if you do not own a high end PC. Flight Gear is a collaborative effort to create an alternate, open source flight simulator platform - I have not checked it in a while but it seems way behind the simulations I have mentioned above. If you are looking to WWII combat simulator, IL-2 Sturmovik is still considered by many the best simulator in that niche. I have to confess I have not tried it. Believe it or not, Falcon 4.0 has still a large dedicated community that over the years has improved it considerably. Frankly I have not checked it in years and I think it is outdated. ...and then there are a many other simulators I have not played. But again these were just my two cents. With apologies for the delays (I was on a business trip in the U.S.) here are some notes on P3Dv4.5 and its compatibility with my planes. First thing: at the moment I am writing, VRS has not yet updated Tacpack to support P3Dv4.5. Tacpack is built in such a way that it needs to be updated each time a new version of P3D is released so it is not a surprise. However, some of my planes rely heavily on it (especially the F-35 and the Typhoon) - so you may want to wait until Tacpack is updated before switching to P3Dv4.5. That being said, on my system P3Dv4.5 works fine with no significant issues. Actually I am under the impression that frame rates and texture resolution are improved (keeping in mind that I typically fly over large photoreal sceneries such as the ones from Blue Sky). The only minor problem I am having is a strange and subtle "blurry" effect in VR which is difficult to describe (and may be due to my system settings)… will report on that after further testing. Everything seems to work fine including STOVL, custom sound and fuel system. Until Tacpack is updated, DAS, TFLIR, A/A radar, loadout configurator and weapon system functionalities will not work. Everything seems to work fine including custom sound and fuel system. Until Tacpack is updated, A/A radar, loadout configurator and weapon system functionalities will not work. This aircraft relies on Tacpack only for the weapon system, so pretty much everything works fine. These aircraft rely on Tacpack only for the IFF, so pretty much everything works fine. All freeware aircrafts will work on P3Dv4.5 to the same extent as they did in P3V4.4. 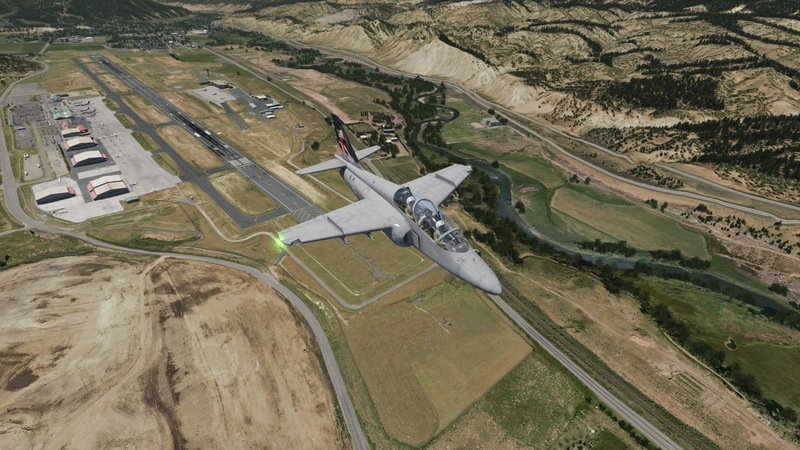 The latest update to Aerofly FS2 has introduced some changes that broke the compatibility with the S-211. The aircraft was still selectable from the menu, but could not be loaded (the sim reverted to the default C172 upon loading). Apparently the compatibility issue is confined to the generator code, which has been replaced. Here is an update to fix the issue. Updated version (full install) can be downloaded from the side bar or by clicking HERE. 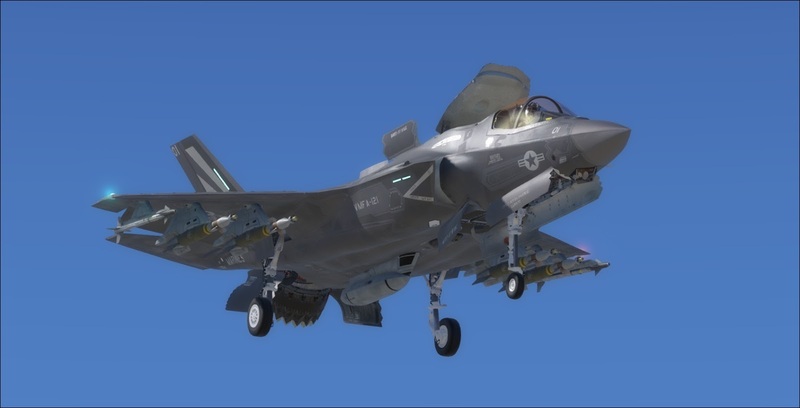 Here is the PBR update for the F-35 package. In order to implement this, I had to rebuild the source models as they had been lost to a ransomware attack years ago... this was quite a big work, and a lot of things had to be redone. Still I think the plane looks much better now and it was worth it - however, please beware that some minor bugs or glitches may be present. Model files were compiled with P3Dv4.4 tools, so they cannot be used with FSX or prior versions of P3D - however, I have also included non-PBR model variants for those who may prefer them (they should provide slightly better frame rates and lower memory consumption). Aside, compiling the model for P3Dv4 made it so that some graphic glitches were fixed. Initially I thought this could be the baseline for version 4.00, big given that the aircraft functionalities are pretty much the same as previous iterations, I thought it was unfair to make it a new, full price version - or even a paid update. However, supporting different variants and options is quickly becoming impossible to manage - so from now on this project will only be updated for Prepar3D v4.4 (sorry for that). * - This update by default is configured to use PBR models and work with P3Dv4.4. You can use this update also with P3Dv4.0 to P3Dv4.3 by deleting the model.cfg files in the model folder of each aircraft and rename the "model.cfg.BackupNonPBR" to "model.cfg". It turns out that even 1.23 was not free of major bugs… so here we are again with yet another update for the Eurofigher. I am sorry for the confusion but, since I have always tried to comply with all the requests I have received, the Eurofighter project is now quite difficult to manage due to its size and model variety (single and twin seater, PBR and non PBR, and then there are the "ubuntu" versions). For this reason, this is likely to be the last update to support FSX or any P3D version prior to 4.4. I am sorry for this, but the mainteinance effort is starting to be quite a burden. Basically the big thing in 1.23 was a bug in the external model that caused Brimstone launchers or missile rails appear under wrong conditions. It did not affect users not employing Brimstones or Meteor missiles...but nevertheless it was annoying. I took the change to add the possibility to pick negative VVs in the NAV menu as requested by one user. Users of P3Dv4 up to version 4.3 can download the 64bit PBR version but will have to change the model.cfg manually to deactivate PBR (or can dowload the 32 bit and change the panel.cfg to select the 64 bit .dll's). As (to some extent) expected with a major update, Eurofighter v1.22 release included a couple of bugs and highlighted some existing defects. The most annoying bug is the fact that the updated FCS code did not work as intended and caused the plane to pitch up requiring constant pilot action - I consider this a severe defect and given that probably I will not have much time in the next few days, I have decided to address it immediately with a further update. Aside, some users reported a loss in frame rate after the PBR update: this is generally to be expected for PBR models, as the compiled model file (.mdl) is larger and uses more textures video memory. On my system, which has a GTX-1080, there is not a big difference - but from time to time you may have a slight delay in loading the PBR textures while switching between external and virtual cockpit views. I have also heard "rumors" (meaning that I had no direct report of that) of users experiencing a drop in frame rates also with non-PBR models and also in previous updates. Frankly, since the modifications to the code were minimal, it is difficult for me to say if the frame rate drop is due to the Eurofighter update or by other reasons. The only thing I have noticed is that there was a missing texture (the fresnel ramp texture used in the canopy) - missing textures may reduce the performance a little...but this should be barely noticeable. Anyway I have included the missing texture in this update. Last, please remember that if you prefer to use the non-PBR model, the files have been left there (they are not overwritten) - so you can activate/deactivate the PBR models in the model.cfg. This update contains backup version of the model.cfg for both PBR and non-PBR for your convenience. 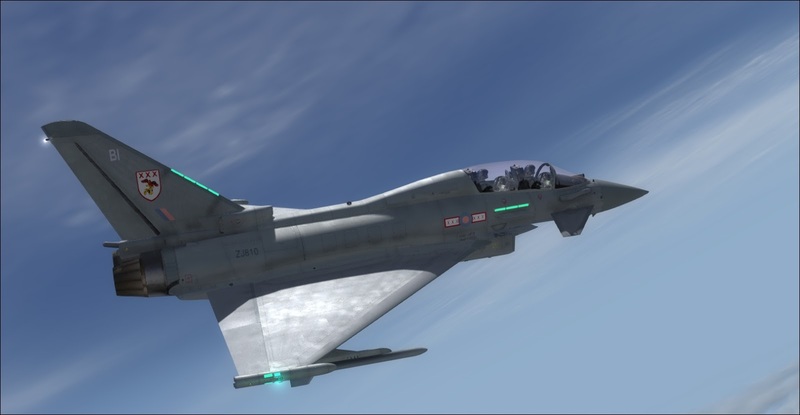 Just delete the model.cfg in the model folders of the Eurofighter_2000 and Eurofighter_2000T, and rename the backup files by deleting the ".backupPBR" or ".backupNonPBR" suffixes. Note that editing the model.cfg gives you also access to the "ubuntu" variants. These are model variants that replaces the FCS driven animations with "standard" ones. These animations are less accurate and realistic, but are compatible with multiplayer. "Ubuntu" models are provided in both PBR and non-PBR versions - please note that you have to use them with the proper cockpit model (PBR external model must go along with PBR VC and vice versa) - otherwise textures may be shown with a wrong color. Users of P3Dv4.0 to 4.3 can install the 64 bit upgrade but are should replace the model.cfg with non-PBR versions as described above. 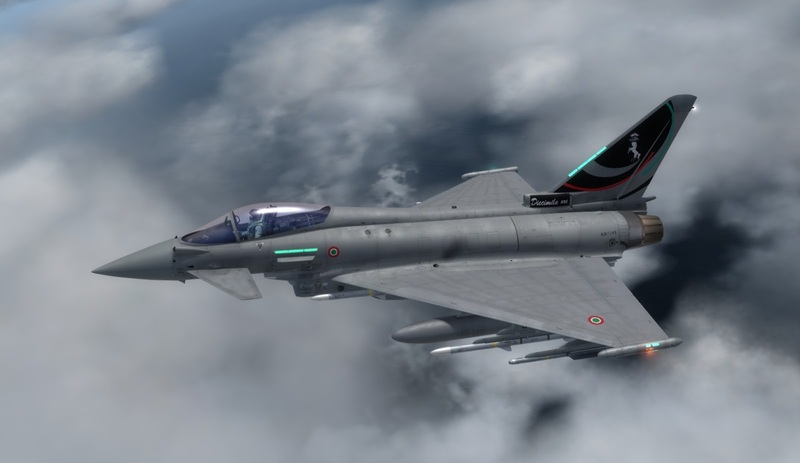 NOTE: THE INITIAL RELEASE OF EUROFIGHTER 1.22 PBR HAD A SMALL GLITCH SO THAT "REMOVE BEFORE FLIGHT" RIBBONS AND COVERS HAD A WRONG TEXTURE - FILES HAVE BEEN REPLACED WITH CORRECTED ONES, ALSO PBR "UBUNTU" MODELS HAVE BEEN ADDED FOR MULTIPLAYER. A couple of sleepless nights playing with Physically Based Rendering (PBR) on the Eurofighter Typhoon model and here we are with another update. For those who do not know PBR, it is a different rendering technique which is supposed to simulate the appearance of 3D models on the basis actual physical proprieties of the material they represent (such as "metalness", roughness etc.). This is a relatively new rendering technogy which, in some circumstances, can provide more realistic results with respect to the traditional techniques. Recent videogames like Red Dead Redeption are a great example of this. In flight simulation, PBR was introduced by X-Plane, DCS and (almost unnoticed) by Flight Simulator World. Note that PBR is a generic name for the approach, and each engine has its own implementation with different results and possibilities. PBR has recently been introduced in Prepar3D V4 starting from version 4.4 - the implementation is quite standard: materials require an "albedo" texture (its base color), a "metallic" texture (which specifies the metalness and, in P3D, also the Ambient Occlusion and the smoothness of the surface), a "normal" texture (basically the old normal/bump map) and an "emissive" texture. In addition, P3D now allows the developers to control the visual proprieties of a material with a LUA script during the simulation - which is pretty great as it allows a number of cool tricks. NOTE THAT PBR MODEL WILL ONLY WORK WITH P3Dv4.4 AND ABOVE. Here are "preliminary" models of the Eurofighter with PBR. While compiling these models I also fixed a couple of minor bugs. As result the update is provided in 2 versions: a 32-bit version for FSX users and users of P3Dv1, v2 and v3 and a 64-bit version which will only work with P3Dv4.4 (you must upgrade your P3Dv4.X to v4.4 or above to use it). The full update with PBR models for P3Dv4.4 can be downloaded by clicking HERE. The partial update without PBR for FSX/P3Dv2/P3Dv3 can be dowloaded by clicking HERE. A detailed rendition of this family of naval turboprops, including analog anddigital cockpits variants, and 4-bladed and 8-bladed prop variants. A highly detailed rendition of the Eurofighter Typhoon, including realistic cockpit interface, working weapon systems (with Tacpack) and realistic flight dynamics. 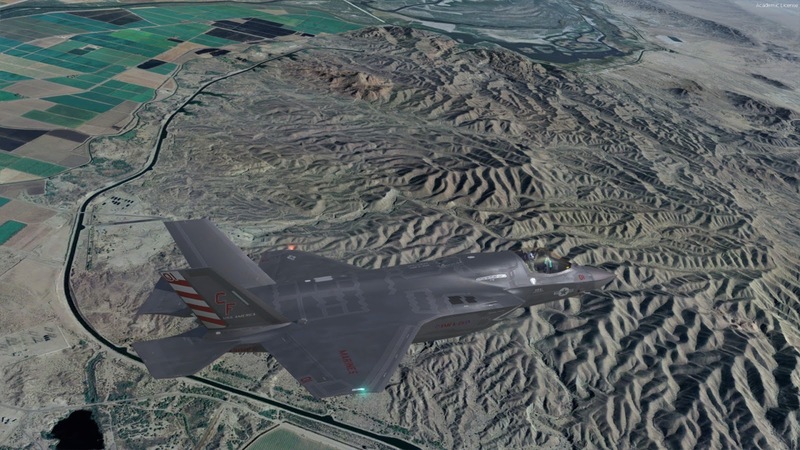 This is a new version of the F-35 project that improves the freeware version in several areas including new visual models, additional avionics functionalities (with TFLIR, DAS and ASR imaging support) and new flight dynamics. A highly detailed rendition of the SIAI Marchetti S-211 jet trainer and its derivatives, the Aermacchi M-311, M-345 and M-345 HET. This section provides download links for the latest official releases of my freeware projects. Normally, these files are also uploaded to avsim.com and flightsim.com, although there is no guarantee that any external website has the latest version. In November 2015, IndiaFoxtEcho Visual Simulation has been officially registered as a company and will venture into the production of payware add-ons. This does not mean that freeware will be abandoned, but rather will provide the means for funding more complex (and hopefully better) addons. The fist two payware projects will be the new F-35 for Prepar3d v.25 and the Military Avatars Package. Still, if you like my freeware projects and wish to make a donation here is a Paypal "donate" button.